Drop offs come in all shapes and sizes, from rock steps, tree stumps/roots or purpose-built obstacles. Learning to negotiate these by jumping will help your trail flow and improve your riding. At some point on red graded trails you will come across a drop off. In some cases these can be rolled, but sometimes and to add some fun they will need to be jumped. Rolling will only work with smaller drops. The bigger the drop the bigger the risk of catching your chainring and going for flying lessons, something we all try to avoid!! Start with learning how to manual on a flat field (video on its way) then progress to little curb sized drop offs where if you get it wrong it won’t matter too much. Once you have got your manual technique sorted on smaller drop offs it’s time to look at bigger drops. With more speed you can just slide your weight back and need less pump to get you over the drop. These will usually require a bit more speed and the entry and exit lines become very important. As you enter the drop off you need to commit, come off the brakes and spot your landing. On exiting let the bike land before cornering or braking, in an ideal world, look where you want to go! Try walking a new line before riding it so you can spot the best line through the feature. Thank you for reading, check back for more posts on mountain biking and Pilates soon! Learning to ride a mountain bike is easy. Learning to ride a mountain bike really well is harder and takes practise and patients. However, get the basics right at the start and you’ll enjoy every minute you ever spend on your mountain bike. Once you have the basic principles of riding a bike like, how to brake and use the gears. There is a whole world of new skills to learn that you can develop to take your riding further and faster. There are two key elements to mountain biking, physical effort and mental awareness. It’s only when you combine them together that you can effectively start pushing your riding boundaries to new heights. Mountain biking involves your entire body. Your core muscles, back, shoulders and arms all play a role alongside your legs and lungs. Mountain biking is a great cardio workout and to a certain extent is non load bearing on your joints which is great! This changes when you start jumping of course! This is possibly the harder part. Mountain biking can be as much a mental game as a physical one. 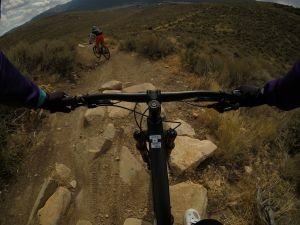 The belief in your own skill and ability holds a lot of riders back and it’s worth working on your mental ability to flow through a trail as much as the physical. This is true for a lot of ‘extreme’ sports knowing what you are capable of and how far you can push your own limits is what keeps us safe and that mental ability to read a situation and keep moving forward and commit is key to riding a mountain bike smoothly. Top tips for starting out mountain biking. This is really important, to enable you to flow through the trail. Stiffen up and grip hard on those bars and you make your life a lot harder. Try to breathe consistent steady breaths from your rib cage. Visualise what it will feel like to nail the section of trail in front of you. You don’t find a lot of straight, smooth trails when mountain biking. Every trail evolves and you need to ‘read’ the sections as they approach. To do this you need your eyes up looking where you want to go. Pick the smoothest line of travel where possible to allow the bike to flow and maintain traction and speed. Effective pedalling comes from being able to pedal in circles think about scraping your foot backwards, like your wiping something off your shoe, at the bottom of the pedal stroke and flicking your ankle as you return to the top of the revolution. Cadence is also important don’t plummet to your lowest gear at the sign of an incline instead try and keep your feet moving at the same pace and when you cannot maintain your rpm (revolutions per minute) change gear. The front and rear wheels both deliver traction, this keeps you gripping the floor and driving the bike forwards. On flat ground you’ll be sat on the saddle or up in the neutral or ‘ready position’ this is where you pedals are level (unless you are pedalling of course) your knees and elbows are bent and fingers are covering the brakes. In this position you are ‘ready’ for trail features with your feet well away from tree stumps etc… Both wheels are weighted due to your position over the centre of the bike. As the terrain changes from flat to up or downhill, you’ll need to adapt the position to slightly further back. For climbing this works in the opposite direction often you have to push more weight through your arms to maintain traction on the front wheel, remember not to unweight the back wheel or you will slip out. You’ll need to constantly adapt the position as you feel the grip or lack of it from each tyre and make the necessary body adjustments to suit. Relaxing and looking where you are going help to make this achievable. Lower pressures will provide more grip and when you are leaning your bike into a corner or tackling rooty trails, grip is king. Running too little pressure will expose your rims to possible damage and snake bite punctures. It can also cause tyre sidewalls to fold and deflect. More air pressure makes the tyres feel like they run faster, it will be easier to climb but you will lose a little grip. Brakes – you have two, use them both! 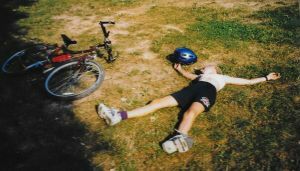 As a child you probably learnt to only use your back brake, maybe you used your front once and ended up in a heap. Although your back break is needed to control your speed your control comes from the front brake on a mountain bike. This becomes especially important on steep terrain when too much back brake allows the bike to skip sideways you need to be using that front brake for traction and control. 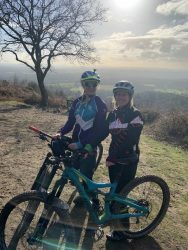 I hope you have found these tips helpful if you are looking at progressing your mountain bike skills and technique working with a coach can improve your riding faster and further than alone. We don’t know, what we don’t know – The value of being coached. Unlock potential you never knew you had. I had my first coach when I was seven or eight, he was my Dad and whether it was climbing at Idwal slabs, mountain biking or kayaking. He had a technique to help me achieve what I needed to get the job done. I wasn’t very competitive as a kid, but as I grew up my hunger for competition grew and with it my understanding of how to bring out the best in other people. When I came home one day and announced I was going to enter a bike race, my Dad said, let’s go to the forest. He found a circuit, like an XC course and timed me again and again and again. The truth is I had no idea what I was getting myself into and my Dad helped me to realise just how much this was going to hurt and how deep I would have to dig to get to my dream of racing elite. It worked. After a few years I hit that shiny ‘elite’ status I had been dreaming of. It was funny because on reaching elite I thought that would be ‘enough’ it wasn’t. I had to train harder than ever and actually my body and mind were a bit over it. I looked for a new challenge, I had always been quite good at endurance so 12 and 24 hour races seemed a good step up, the technicality of a 12 or 24 hour solo race was exciting too having to plan out food and think about being mentally as well as physically prepared. I made it to my first 12 hour solo podium and decided now I could go further. The Trans Alp Bike Race was a seven day stage race across the Alps like nothing I had done before but I had a good grounding in training and so to start with I did what felt right, but something was missing I’d go out on long rides and completely blow up, I was doing unstructured weight and interval training. I needed a guide to help me get to my goal or I was in danger of not getting to the start let alone the finish. I reached out to a mountain bike coach, someone who had far more experience than I did and he helped build a plan that suited my lifestyle and got me to that finish line. Within a few weeks my training had completely changed and with my coaches guidance I was seeing improvements. I was already good at training and able to push myself but the problem was I didn’t know what I didn’t know, so I couldn’t possibly of structured a plan like my mountain bike coach because I didn’t have that knowledge and expertise to create it. Being a coach myself I love helping other people progress and it’s nearly always the small things that help riders to really feel more confident on their bikes or help them understand how to flow faster through the trail. As British Cycling would say, it’s all about marginal gains. These are the things that you either know or you don’t and having a coach can really help because they can see what you can’t. If you aren’t convinced on getting a coach, here are some reasons why maybe you should. You’re already quite happy riding round your local trail centre with mates. You have made progress and feel you can teach yourself. This is a great start, but there are probably parts of your mountain biking that you haven’t considered. An experienced coach will pick up on these small things and help you correct them to make you more efficient. I’m learning at my own speed. Coaching isn’t about rushing the learning process it’s about improvement through streamlining. 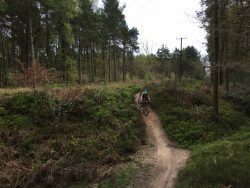 We are all time crunched, why spend months practising something on your own that a mountain bike coach could help you do in a day? Coaching costs money and you’d rather not spend it. This is a fair point, coaching costs money. Biking itself is not exactly a cheap sport, so I guess it comes down to how much you want to get out of your mountain biking time. If you are looking to go faster, then coaching is certainly a good investment, better than any carbon handle bar! In my opinion anyway. 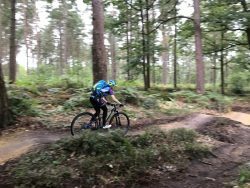 Get in touch with me about how I can help you with your mountain biking, whether you are dusting off the bike after a few years off or looking towards new race goals, I can help. Fartlek is Swedish for “speed play,” and that is what this training session is all about! Fartlek is unstructured and alternates moderate-to-hard efforts over a period of time. During the winter months it’s good to mix up your training on the bike to keep you energised and excited about layering up and pedalling on. Nothing quite gets your heart racing like mountain biking, hitting the trails, zipping along on two wheels through singletrack. As a beginner it can be a challenge to navigate through wheel sizes, suspension set ups and handle bar length. I remember my first mountain biking adventure as a 10-year-old riding my ridged Raleigh bike from Halfords on a holiday to Slovakia with my Dad and Step Mum. Sometimes the hills were so steep my Dad had to tie a rope to the front of my bike and ‘tow’ me up them! 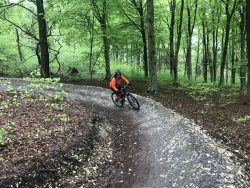 But I loved the singletrack and the exhilarating feeling of racing downhill, trees whooshing by as my mountain bike gripped the ground with its knobbly tyres. Go to a bike demo! Before spending your hard earned pennies on a bike, it is worth riding a few to see what works for you. The best way to do this is at a bike demo day or hiring a bike so you can really test it. Riding around a shop car park is not going to help you know if that mountain bike is the right one for you, far better to go and get it muddy! Your local bike shop and trail centres are good places to start on finding demo days. A quality bike helmet is one of the most vital bits of kit you can buy. Making sure it fits properly is the next step, you should be able to get two fingers between the top of your helmet and your eye brows, the plastic pieces on the straps should be a cm under your ear lobes, this stops the helmet rolling back and the chin strap if you look down should be tight enough to keep the helmet in place but not so tight that you can’t breathe. So, Bike, check. Helmet, check. I would also recommend getting a good pair of biking gloves and safety glasses to protect your hands and eyes. So you’re ready to hit the trails! 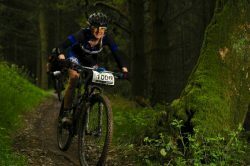 Mountain biking is great fun and these next few tips will help you enjoy your time on the bike. 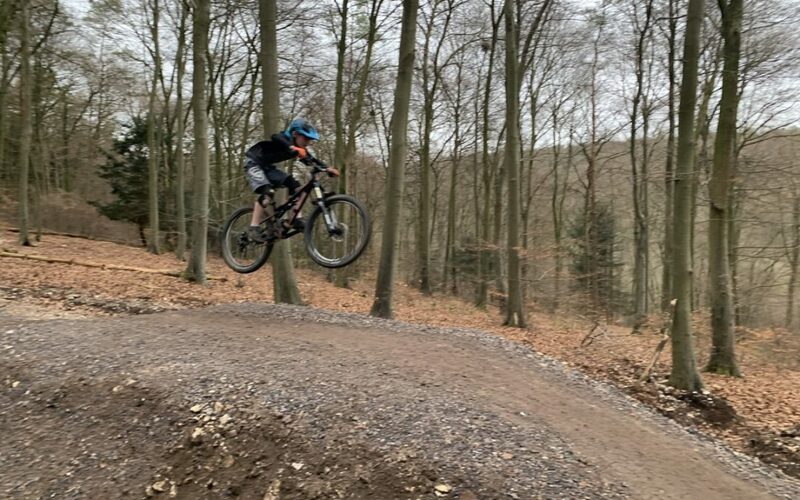 Move around the bike – mountain bike tyres are knobbly so they grip the ground, don’t pump them up rock hard unless your planning on riding on the road or up steep hills, this will give you more grip and with it more confidence in your mountain bike. Practise leaning forward, backwards and side to side when you ride on non-technical ground to feel how the bike handles. Moving around your bike helps keep it flowing down the trails. 2. Cornering – When cornering your mountain bike do all your braking before the corner, enter the corner wide and exit on the inside. Look around the corner and use the banking (berms) to help carry your bike around the corner. 3. Look ahead – Riding through singletrack, obstacles will appear quickly as you glide through the trees, to be able to react and look for the smoothest line you need to look ahead down the trail. I hope you found this helpful! For more mountain bike coaching advice please subscribe to my newsletter. Anyone can be a passenger on a bike. Like with any sport to become more confident and able it’s a good idea to get professional coaching. 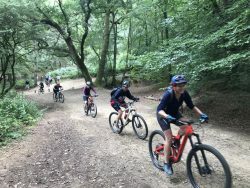 On a blustery April weekend eight women from across the UK descended on the South Downs to improve their mountain bike skills. 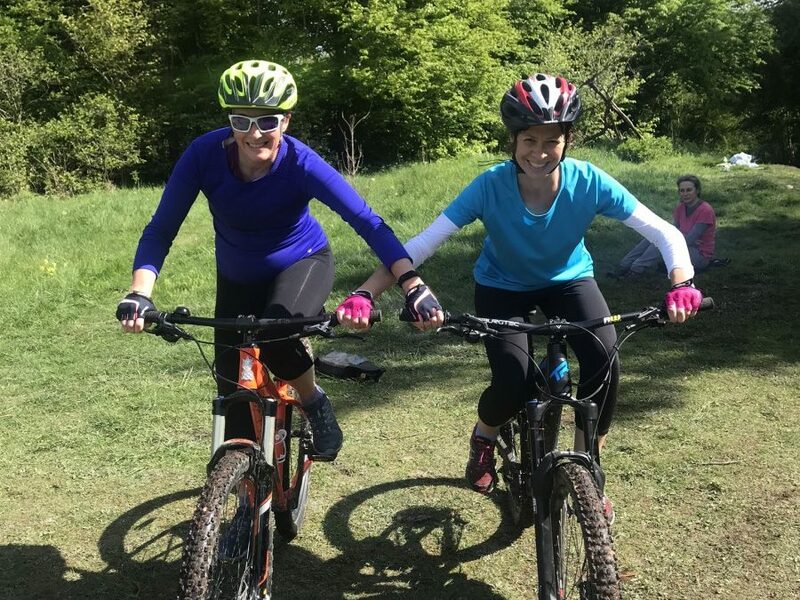 I teamed up with local guide Sean Howell from Marmalade Mountain Biking to deliver a fun weekend of biking, good food and Pilates, all that was missing was sunshine! 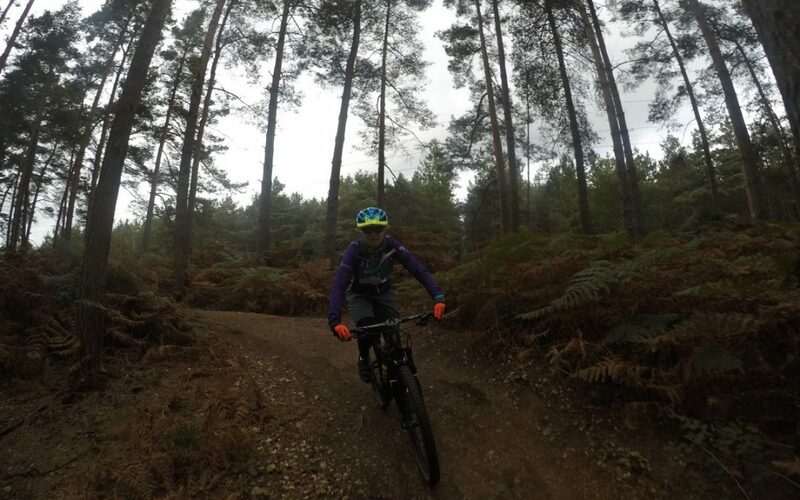 The weekend started with coaching from Queen Elizabeth Country Park, the home of my mountain bike club, Pedal 2 Pedal. The ladies worked on the fundamental bike skills, balance, body position and cornering. Getting your body into the right position and being able to move around the bike is a key skill when riding a mountain bike, you need to be able to flow down the trail keeping your movements free and not jerking the bike around which happens with bad technique and a lack of confidence because you tend to be more ridged. Lunch was provided by a local chef who served up a beautiful selection of salads, pastries and of course cake to keep even the hungriest of riders satisfied. After lunch the girls hit the new blue trail at Queen Elizabeth Country Park to put their new found skills to the test. Another key aspect of cycling is body conditioning and core stability, the girls were treated to a private Pilates class in Rowlands Castle by local Pilates instructor Stacey Merritt after winding down the girls were ready for a pub lunch and to talk all things bike. Bright and early Sunday they headed to Cocking Hill on the South Downs to meet with local mountain bike guide and trail expert Sean from Marmalade MTB. 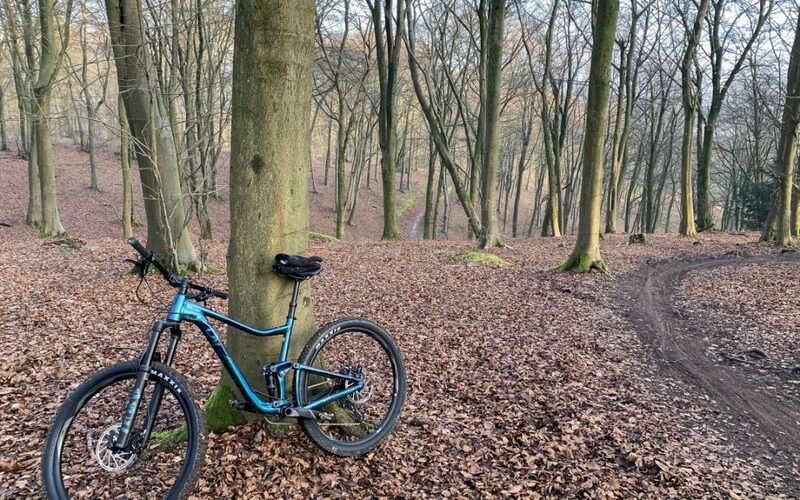 Sean took the girls on a whistle stop tour of some of the best trails and viewpoints along the South Downs including The Goodwood Estate, Kingly Vale and the Hooksway. The weekend was designed for ladies who have a little experience off road but wanted to increase their ability and go somewhere new to explore. They all left with smiles on their faces and a new enthusiasm for mountain biking one they will hopefully share with their friends. 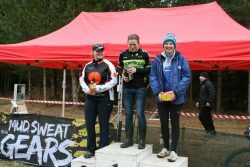 My aim is to get more women out on bikes and introduce them to this fantastic sport. This is hopefully the first of many weekends Sean and I will run. If you would like to improve your skills or get out and explore some new trails get in touch or head to Pedal 2 Pedal for more information.